Khaled Hosseini, bestselling author of The Kite Runner and A Thousand Splendid Suns returns with his newest book, And The Mountains Echoed. In his latest novel, Hosseini chronicles the story of a brother and sister in a small Afghanistan village, bound together deeper than blood. At a young age, the two become separated and we learn their story indirectly through tales told by those connected to them. 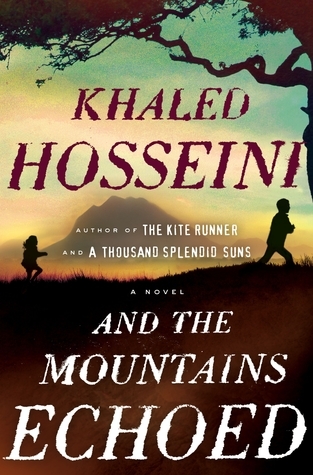 Hosseini takes a different approach in And The Mountains Echoed than his previous works. Each chapter follows a different character in the story, starting with the brother and ending with the sister. At first, it may appear to be a collection of short stories, but a pattern soon becomes noticeable, creating a complex story of characters fitting to its title. The reader experiences a wide array of perspectives, a mixture of life in different worlds, and a connection among them all that will leave a lasting impression. And The Mountains Echoed is not my favorite Hosseini novel (A Thousand Splendid Suns takes that honor), but it is still a story that begs to be read and shared far and wide. Each of the narrators has a story to tell and a lesson to share. I believe that Hosseini has proven his talent once again! What is your favorite Hosseini title? Why? Dying to get my hands on this one! Suey ... I definitely recommend this read. I'm a big fan of this author!